As you write code, Visual Studio will let you know that you’ve used an identifier that it doesn’t know by marking it with a red squiggly underline. Below, we’ve started creating a class that derives from Shape. 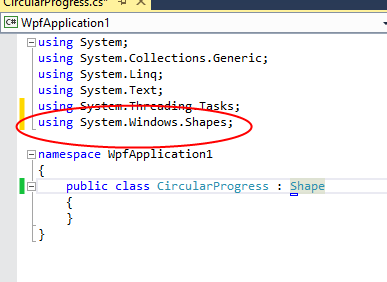 But Visual Studio tells us that it doesn’t know about Shape. The easiest way to resolve this is to try right-clicking on the unknown identifer and selecting the Resolve entry. Visual Studio will give you a list of namespaces that it can find the identifier in. 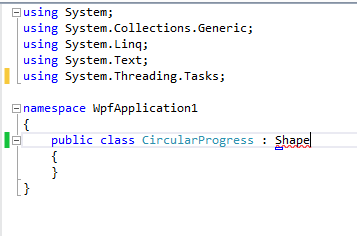 You can then select one of these options and Visual Studio will add the relevant using directive. Note that this will only work if the identifer is valid somewhere within the assemblies that your project has referenced. If you have correctly spelled an identifer and the Resolve option does not appear, you will need to add a reference to the assembly where the identifier in question is defined.